Award winning photographer and filmmaker. Alex is a New York Film Graduate, who began his career in acting and photography in LA. Alex’s photography has been converted into art installations and featured in exhibitions at the Horele-Geggenheim in New York, and has won the coveted the David Attenborough ‘Back Climate Change Action’ award. Alex was recently signed by RSA films, and now works as an accomplished writer, and director Alex is best known for his work on: Star, The Last Boat to Alcatraz, and Lighthouse Lesvos. Francesco is a successful independent filmmaker, and founder of production company Envoi Entertainment. Francesco has half a decade’s experience taking projects from script to screen, most notably on the feature length thriller: Tear Us Apart, TV documentary: Lighthouse Lesvos and various independent short form content that have screened across US, Canada, Spain and Germany. Successful Producer of over sixty feature length narrative and documentary films, and founder of Fu Works Pictures. Fu Works has produced several award winning feature films, such as Suskind, Tinza (Dutch entry best foreign film – Academy Awards), Winter in Wartime (shortlist best foreign film – Academy Awards), Kenau, Love Is All and Black Book (shortlist best foreign film – Academy Awards. Co-Producer/Editor of the Oscar winning documentary Bowling for Columbine & award winning Fahrenheit 9/11. Director/Producer/Editor of Fat Sick and Nearly Dead 1 & 2, and The Yes Men Fix the World. 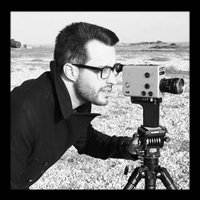 Giorgio Galli is a creative and technically minded editor with over ten years experience working in TV and films. Giorgio has edited factual content for the BBC and ITV, and worked on feature films Astral and The Messenger. Viche’t is the founder of Beyond Time Pictures a successful London based production company. Viche’t is a jack of all trades, and technical guru. He has supported Refugee with his technical expertise in sound recording, camera operating, drone flying, and editorial prep. Accomplished composer best known for his work on Last of the Mohicans, and In the Name of the Father.